Sure it’s business. But, it’s become a tradition. For more than 40 years, this North Carolina family has come together this time of year to supply our nation with that most towery of Christmas symbols. In 25 states, Christmas morning will be celebrated at the foot of Fraser Firs grown on Hawshaw Mountain in Avery County, N.C. Since 1959, Sam Cartner Sr. and his family have planted seedlings of this native in Hawshaw’s rich soil. Their work has created massive plantations of Fraser First that cover the mountain in a blanket of deep green that takes on a bluish hue when the sun is just right. Fraser Firs the size of pencils shoot from narrow seedbeds in some areas. In other places, trees 4 or 5 years old stand almost waist high. The 360-degree view at the mountain’s 4,500-foot crown includes close vista of Grandfather and Grandmother mountains in North Carolina to the northeast and Roan Mountain in Tennessee to the northwest. Sam Cartner’s Fraser Fir business at Cartner Farms in Newland, N.C.
Far below Cartner, harvesting crews could be seen felling trees, feeding them through a baler that neatly wrapped the first in plastic mesh and loaded them on trucks for transport to the base of the mountain. This work begins in late October for trees that will be shipped to cold climates in the Upper Midwest and to the Rocky Mountain states. It will not end until mid December. Carter, 83, said the people in Minnesota want them early, just in case they get big snows and the trucks can’t get in to deliver. 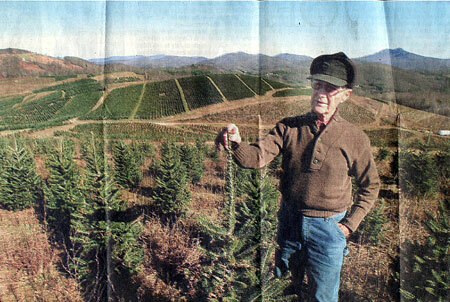 There are almost 400 Christmas tree farms in the North Carolina mountains, with dozens in Avery County. This time of year, highways in North Carolina’s Christmas tree country are busy with trucks that are laden with Fraser Firs. Cartner starts the growing cycle with seeds he purchases from Weyerhaeuser, the large paper-producing company. The process from seed to sell can take seven to eight years, at least two of which are spent in seedbeds, and another two in transplant areas. From left to right: Pedro Sanchez, Margarito Rodriquez, and Adrian Gonzalez bail trees. At year six, the trees will be between six and seven feet tall. Cartner has a degree in agriculture education from North Carolina State University. 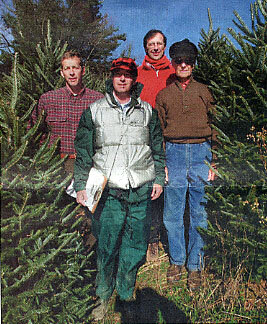 Until the 1980s, when he decided to work full time with the Christmas trees, Cartner was an Avery County extension agent. A year ago, Cartner was inducted into the Western North Carolina Agricultural Hall of Fame as a pioneer and innovator that helped turn the state’s counties with elevations above 3,000 feet into major Fraser Fir producers. 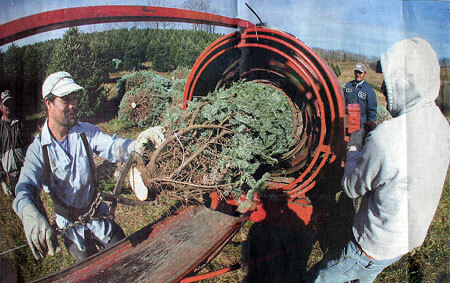 More than 4.5 million Christmas trees were harvested in North Carolina last year, 95 percent of which were Fraser Firs. Others include white pines, Leyland Cypress and cedars. The cool soil and cold high county winters make at least 14 Tar Heel counties perfect for growing Fraser Firs. North Carolina is the second largest grower of Christmas trees in the nation behind Oregon. Cartner said he tried other types of trees at first, but then settled on the Fraser Fir. “We decided if we were going to make a go of it, we’d better stick with the tree nature put on these mountains,” Cartner said. The farm does grow some white pines that workers use to make wreaths. On Tuesday morning, a brisk breeze blew the fragrance of cut limbs into the yard outside a building where workers wrap the boughs around wire frames. Most of the Fraser Firs grown at Cartner Farms are sold to garden shops. But Margaret Cartner, Cartner’s wife, also operates a mail order business for the trees as well. And like many farms in the area, they operate a cut-you-own business between Thanksgiving and Christmas. Getting the Christmas trees shipped each fall in time for Santa’s visit requires the help of Cartner’s three sons and 26 hired staff. From left to right: Jim, David and Sam return home each fall to help their dad, Sam, at their farm in Newland, N.C.
Jim Cartner, 50, is a veterinarian who lives in Statesville. His brother David, 52, is an Asheville lawyer. The youngest Cartner brother, Sam, 47, also is a veterinarian and he is a professor at the University of Alabama-Birmingham. “I like to get out of the office,” said David, who shares a law practice with his wife. On this day, David directed a dozen workers who packed 500 Christmas trees on tractor-trailer rigs that were being loaded for garden shops in distant destinations. Sam cares for the animals that the University of Alabama Medical School uses for research. All three brothers take several weeks off from their jobs each fall to help harvest trees off Hawshaw Mountain. “I remember when we shipped our first truckload out of here,” Sam Cartner said as he waited for a harvest crew to resume work after their lunch break. Last year, the youngest of the Cartner’s children conducted a school science project to determine which of several liquids was best for keeping a cut tree fresh during the holidays. Pure water, not some fancy elixir, scored the best in their tests, Sam Cartner said. Recently, the Cartner brothers returned home to their family farm in Newland, and to Hawshaw Mountain, for another season of harvesting Christmas trees. Earlier this week, Sam Cartner Sr. drove his Chevrolet four-wheel-drive pickup for visitors over some of the 10 miles of steep service lanes that wind between plantations of Fraser Firs on Hawshaw. Winds blew through the stands, making the 42-degree temperature feel much colder, as Cartner spoke about his work to grow Christmas trees. It’s way too soon for Sam and Margaret Cartner to think about putting up a Christmas tree in their own living room. They’re too busy making sure people in some distant state will have one to drape with decorations. “I’ll put one up as soon as I get relaxed from all this,” Cartner said.